But I don’t know, maybe we should just leave him to it. I hate to say this, but honestly, I could do with less Adam at this point. This is a little surprising, because so far I’ve been a loyal booster for Adam and his storyline. For one thing, I think he’s really cute, which isn’t everything but it certainly doesn’t hurt. He’s also had a really clear through line, which they’ve elaborated on in minute detail. Each interaction is meaningful, and pushes the character forward. We know literally everything that there is to know about Adam, except where he goes to the bathroom. Besides, the only question worth asking about a television character is, “Is he interesting to watch, or boring to watch?” Adam is interesting to watch. Case closed. But he’s been holed up in the west wing for way too long. We’re currently in the middle of a five-week period where Adam appears in nineteen out of twenty-five episodes, and thirteen of them take place in this room. It’s kind of driving me out of my mind. Meanwhile, Barnabas is nowhere to be found. Do you remember Barnabas? This used to be a television show about Barnabas. Back in May, Jonathan Frid went on an insane ten-city publicity tour to promote Dark Shadows, capitalizing on the teenage audience’s astonishing appetite for Barnabas Collins. But as soon as Frid came back, Barnabas basically dropped off the canvas. He’s still showing up on camera now and again, but for the most part, he’s stubbornly refused to take any positive steps to move the storyline forward. He’s become entirely passive, leaving everyone else to take action on his behalf, if they choose to. This is a guy who was buried alive twice, in the space of a month. He is not the storyline dynamo that we once knew. So let’s take a look at what Barnabas has accomplished so far this summer. 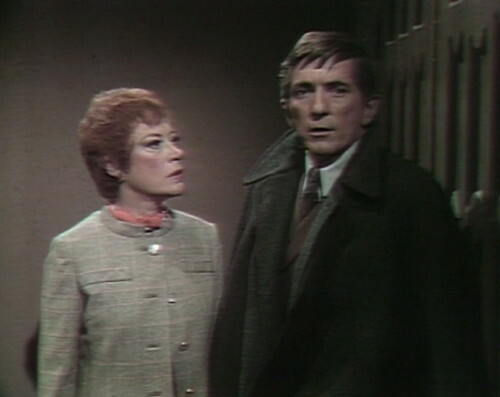 The decline and fall begins in late May, when Barnabas and Julia are keeping Adam locked up in the basement. Unsatisfied with his accommodations, Adam checks out, strangling Barnabas on his way in lieu of filling out a comment card. The howling, desperate creature runs out into the night, and Barnabas grabs a gun to give chase. He follows the monster to Collinwood, where Adam grabs Carolyn and makes for the woods. 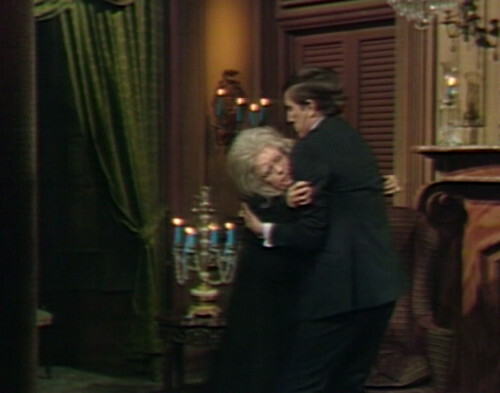 Barnabas pursues Adam, and at this point, you’d think that it would be a snap to catch up. Adam isn’t going at top speed; he’s dragging the struggling Carolyn along with him. She’s screaming for help, and anyway, she’s wearing an outfit that’s practically fluorescent. There’s absolutely no way that Barnabas could possibly lose sight of them. Except he does. We don’t even see him until four episodes later, when the Sheriff comes over to ask him what he knows about the crazed maniac who kidnapped Carolyn. 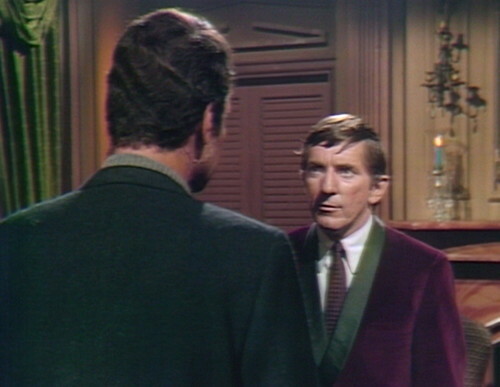 Barnabas says that he assumed they’d already caught the man, and that Carolyn was safe at home. The implication is that he just got bored with the storyline and forgot all about it. As we head into June, Carolyn is saved, no thanks to Barnabas, and Adam jumps from the cliff at Widow’s Hill. 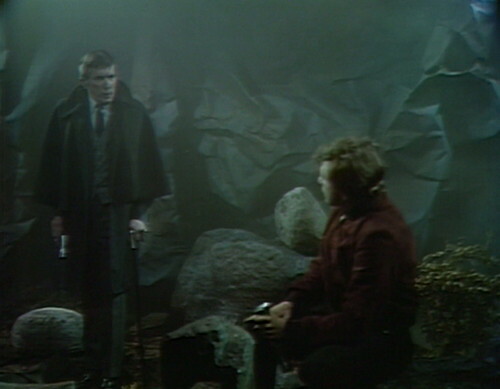 Barnabas and Willie start hunting for Adam again. They search for days and days, with no result. 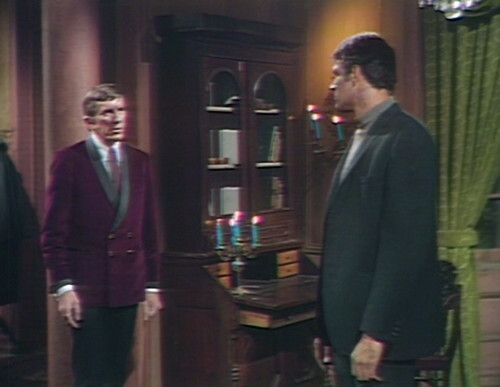 Five episodes later, Barnabas finally comes home, and walks downstairs into the basement, and there’s the ghost of Reverend Trask. 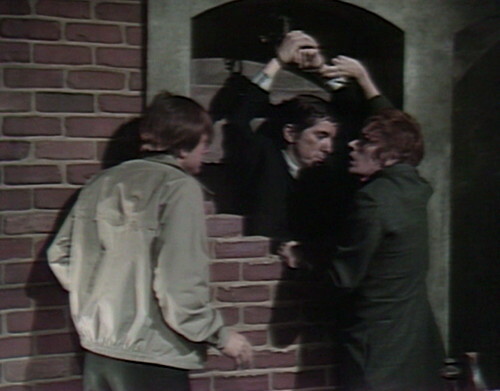 As punishment for Barnabas’ sins, Trask chains him to the wall and constructs a weird mock trial around him. 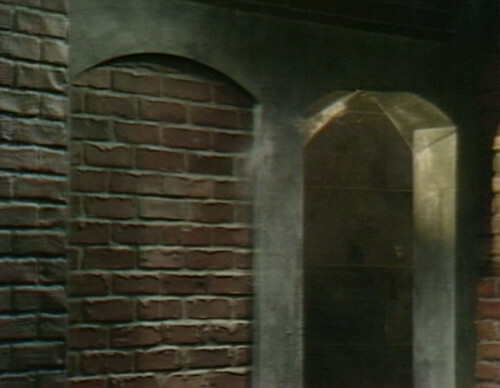 Barnabas doesn’t know who called up the spirit of Trask, or why the alcove wall was broken down. Nobody tells Barnabas anything these days. Then he’s trapped behind a brick wall for four episodes. Julia and Willie finally rescue him, and just in the nick of time. 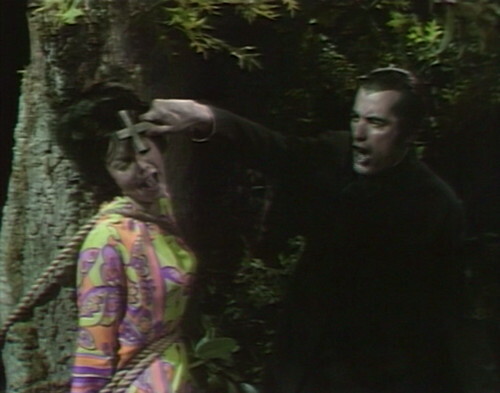 Now that he’s free, Barnabas can put a stop to all of Cassandra’s wicked machinations. But not really. He’s out for another four episodes. Meanwhile, the ghost of Trask ties Cassandra to a tree and performs an exorcism, banishing her from the mortal plane. Now, technically, Cassandra and Trask are both part of Barnabas’ rogues gallery, but apparently it’s okay if the major plot points happen when he’s not around. Instead, Barnabas spends the next several days wondering what’s going on. Is Cassandra really gone? Is Trask’s spirit at rest? Who’s the man claiming to be Cassandra’s brother? Where’s Angelique’s portrait? And so on. 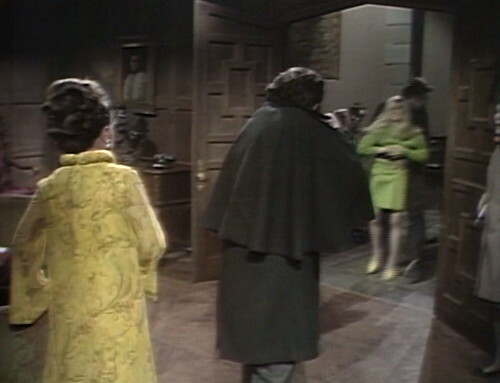 Barnabas and Julia are surprised by Nicholas’ arrival at Collinwood, and they rush off to Professor Stokes’ house to tell him all about it. We don’t know if they ever make it to Stokes’ place. 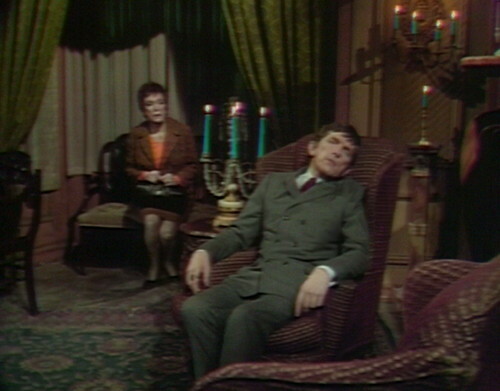 Barnabas pulls another disappearing act, and he’s off screen for the rest of June. We pick him up again in the second week of July, and he’s just sitting around, reading quietly and wearing his burgundy smoking jacket. Over the last couple weeks, Nicholas has summoned Cassandra back to life, Adam’s learned to talk, Vicki was visited by the ghost of a friend’s dead father, Joe was clobbered by an assailant and taken to the hospital, and basically Collinsport has been plunged into confusion and disarray. Meanwhile, Barnabas sits and reads. When he finally decides to take an interest in things, he marches over to Collinwood and offers Cassandra his love, if she’ll call off the Dream Curse and leave Vicki alone. She says she’ll think about it. That doesn’t work, obviously, because nothing works, so Barnabas decides to just go to sleep and have the Dream, and if it kills him, then it kills him. Who even cares. So he has the Dream, and then he wakes up, and nothing’s happened, and everything’s fine. But not really. A bat attacks him, and he falls to the ground, weltering in gore. Julia and Willie decide to bury him, like you do, and that’s the end of that. But not really. 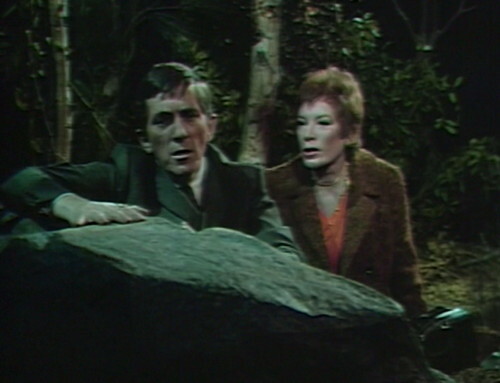 Julia and Stokes dig up Barnabas again; it turns out he can’t even die correctly. Barnabas climbs out of his coffin, finally ready to take control of the storyline again. But not really. We don’t see him for another four episodes. When he finally decides to show up for work, he goes to Collinwood to ask Carolyn where Adam is. She says she doesn’t know. Another four episodes go by. We’re into late July at this point. 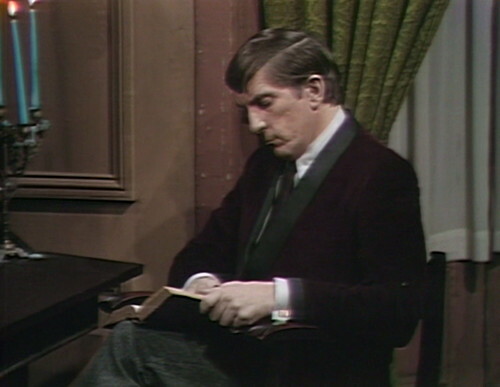 Cassandra goes to the Old House to see Barnabas, and I swear to God, he’s still sitting around in the Old House, reading. I don’t know what he’s been studying up on lately, but apparently it’s pretty compelling. By this point, it’s seriously an open question whether he’s even on the show anymore. Cassandra points a gun at Barnabas, telling him that Nicholas has taken away her powers, and if she has to die, then he’ll die with her. Barnabas has no idea what she’s talking about. He gets the gun away from her, and Cassandra runs off into the night. Julia snatches up the gun, determined to end the witch’s reign of terror, which has pretty much ended already, no thanks to Barnabas. 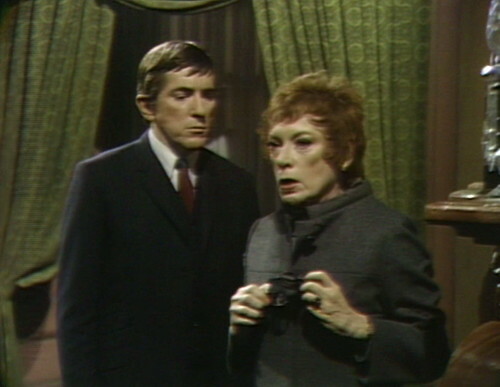 Barnabas tries to persuade Julia to leave it alone, and just let the storyline play out. He practically invites her to join his book club. 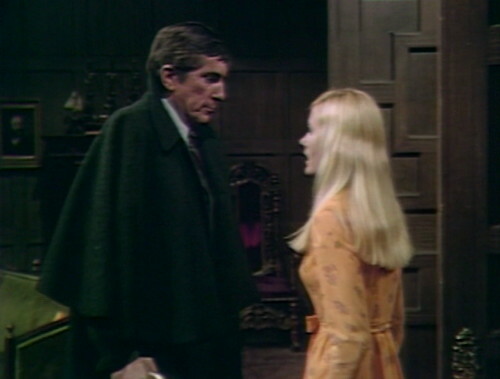 Everybody walks back and forth between Collinwood and the Old House a couple times, and eventually Barnabas finds Cassandra in his house again. She’s aged terribly during this storyline. We all have. So Cassandra dies, no thanks to Barnabas. 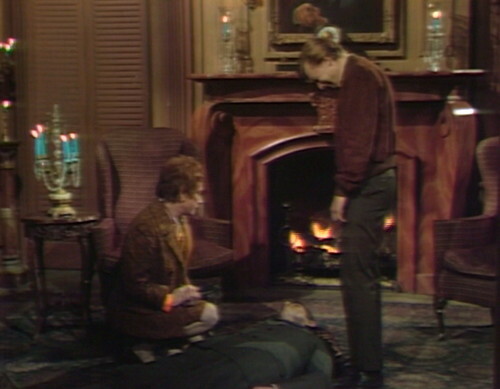 He props up the corpse in an armchair, and runs back to Collinwood to tell Julia what happened. When they return to the Old House, Cassandra’s body is gone. 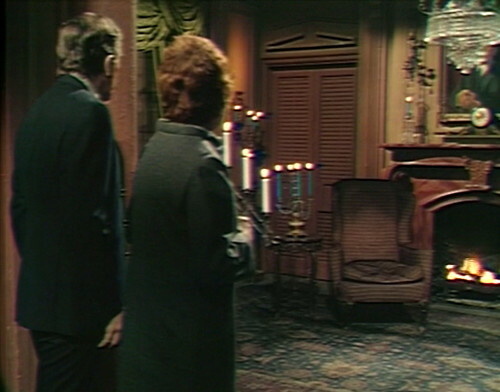 Barnabas can’t even keep track of the dead person that’s sitting in his living room. 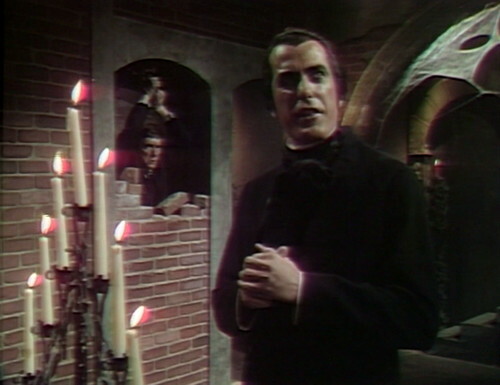 So that brings us up to date, here in early August, as we find Barnabas standing around in his house, lighting candles. 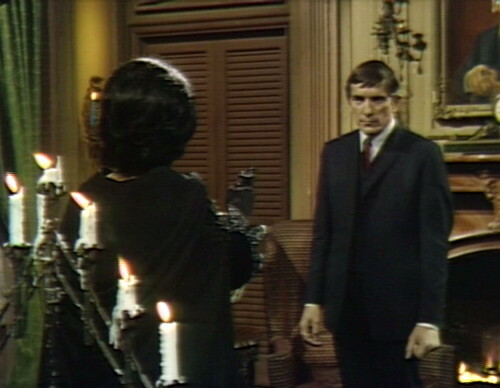 Adam stops by, and says that he wants Barnabas to create a woman for him. Barnabas says he’ll think it over. Adam broke a mirror at the end of yesterday’s episode, and he breaks another one when he repeats the scene in the reprise today. You can tell that they’re two different mirrors, because they break in different ways. Then in act 1, the mirror has been replaced by a third broken mirror, with a different pattern of smashed glass, so that they can set up shots with Adam reflected in the broken pieces. In act 3, when Carolyn approaches Adam, the camera wobbles. Nicholas forgets the word “positive” at the end of act 3, and tries to substitute. Given the botched line, Carolyn’s response is amusing. Nicholas: Isn’t it strange how sometimes a near tragedy can bring back a possible… uh, probable result? Carolyn: What do you mean? When Adam reminds Barnabas of the words he used to know — “Music! Food! Friend!” — a boom mic comes into shot. We don’t know where Adam goes to the bathroom because there is no bathroom at Collinwood. In fact, what we do know from viewing the series thus far is that there are only two restrooms in all of Collinsport, one each for the guys and gals–and they are both at the Blue Whale, somewhere to the left of the payphone. That’s a good point you bring up about Barnabas being less of a driving force in the overall story arc to the point of hardly being involved at all. It was around this time or not long after when Jonathan Frid was among six cast members participating in an interview on the Ron Barry Show, during which Frid confessed, “I don’t know quite what I’m doing at this point,” after explaining to the host how Julia and Dr. Lang “saved” him. It must have been a conundrum for the writers, now that they have taken the “bite” out of the Barnabas character–what exactly do you do with a humanized vampire? 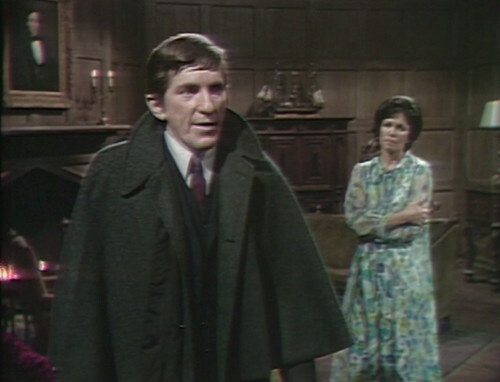 At present, Barnabas does seem to be running the risk of “Victoria Winters syndrome”–that is, a character who was once the main protagonist and focus of the show, but who, as circumstances change and new characters come along and situations arise, becomes less involved and finally peripheral. Fortunately, they came up with the time travel stories for 1897 and 1840, in which Barnabas could “revert” but where he would take on a mission that would propel and define the overall focus of the story. Otherwise, who knows what would have happened to the Barnabas character? Barnabas saves the show at one point, but then eventually the character itself will need to be saved, to be infused with new life if you will. It was sputtering toward the end of 1967, and again in the summer of 1968. Barnabas was saved by the past–first by 1795, then again by 1897. Where in the show were they supposed to ‘kill off’ Barnabas as originally planned? Was it around the time they killed off Dr Woodard instead (around episode 335?). Up until that point the stories were moving along at a ‘logical’ pace (i.e. new character intro, buildup, grand finale then move onto the next new character..) – the only ongoing thread was the mystery of Vicki. The writers had about 2 months of floundering between 335 and 365 when they recovered with 1795. Once the 1795 story ended you can really tell they are at a loss as to how to handle Barnabas as a regular character. Once well rounded and predictable characters such as Roger, David, Carolyn, Maggie and especially Vicki are all over the board. Main character Burke is gone and Joe becomes a broken man (his breakup with Maggie was truly sad.) 1897 and Quentin is the next time the show gets a vital shot in the arm. 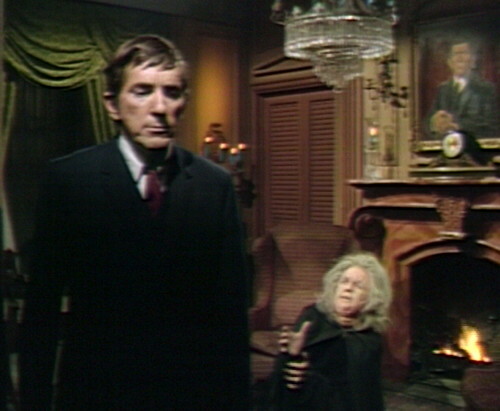 Barnabas was only supposed to be on for about 6 weeks or so, and was to be staked by Dr. Woodard, who was to have discovered that Maggie was being kept at the Old House. Jonathan Frid only agreed to audition for the role when his agent mentioned this temporary part on a soap and that he could earn some extra money to go out to the West Coast with, since Frid was at the time making arrangements to become a college drama professor that fall. But the fan mail poured in, so the character became permanent. 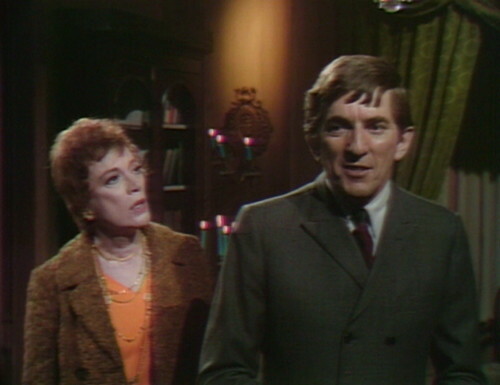 If Barnabas had been killed off in the spring of ’67 as originally planned, the writers were set to resolve the storyline with Vicki by revealing that she was indeed Elizabeth’s illegitimate daughter–though as Art Wallace had it originally, she was actually the daughter of Paul Stoddard who’d had an affair with Betty Hanscombe, who was related to one of the butlers at Collinwood. Thanks for the update – it just seemed strange that the vampire story was only planned for six weeks, or thirty episodes max. That seemed like a very ‘rushed’ schedule – even Bill Malloy got about seventy episodes to properly finish his story, not even counting his guest appearances as Vicki’s ghost savior. I guess the fear of impending cancellation had the writers jumping through hoops by the time Barnabas showed up at Liz’s door with a ‘cane and a smile’. Another trivial issue I thought about was when Barnabas first presented himself to the present day Collins family he was dressed in a contemporary style suit, not what he rolled out of the coffin in. Willy probably had to go the Men’s Wearhouse in Portland to buy Barnabas new clothes since there was no time to have any custom suits tailored, unless the tailor came to the Old House only at night and took measurements only by candlelight…. The issue of clothing wouldn’t necessarily be trivial, as he would have liked to blend in as smoothly as possible. 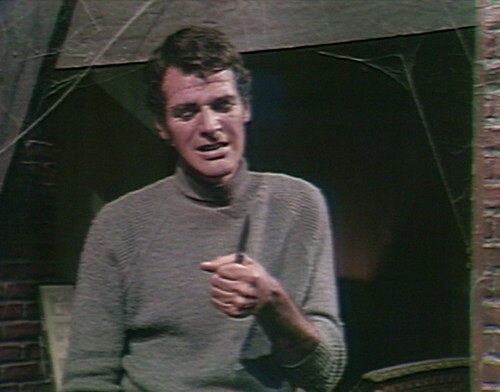 No doubt Willie was ordered to find appropriate modern clothing for Barnabas to present himself to the Collinwood of 1967 with–in fact, the issue of clothing is mentioned in the script during the 1840 storyline when Barnabas is released from his coffin (before the present-day Barnabas can make it back to 1840 to save Julia from impending peril), and where Barnabas instructs Ben to get him some clothes so that he can present himself to the Collinwood of 1840. Period clothing is an issue that is typically mentioned in the script and must be addressed straight away before the time traveler can proceed with their mission. 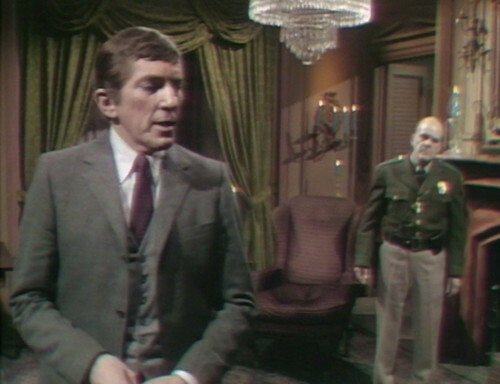 Here’s an interesting clip taken of Jonathan Frid visiting the real-life model for Collinwood, Seaview Terrace (aka Carey Mansion) on Memorial Day weekend of 1985 (as filmed by Dark Shadows fan Guy Haines), during which “Barnabas” shows us external views of the house not seen on the show, and then just before the terrace view that we are all familiar with, he points out the corner of the estate where the camera crew would be taking pictures in 1966–and also where Barnabas likely “scouted the place” before his first arrival there in the present day. He also makes a mention of the Adam storyline and the time he spent hiding in Collinwood when pointing out the “west wing” of the house. Frid also takes the viewer on a tour of the cliff walk area that represented Widow’s Hill and then stops off outside The Blue Whale (The Black Pearl restaurant). Thanks – fun info – I would love to go and see these places in person – I think the Seaview House burned down (?) but the Black Pearl and the Newport Mansion would be fun to visit. Spratt Mansion in Tarrytown, New York, is the name of the model for the Old House that burned down. There were plans to build condominiums on the property, but instead the estate is being used as a greenway and is protected from further development. They were in a pickle with Barnabas. He was originally written as an unremitting villain supposed to be killed off. Then he was too popular and could not die, but they had gotten him to be too much of a villain and they ended up in a dead end (culminating in Woodard’s murder). It got to the point of either he got killed off, or he started killing off regulars, so they got Vicky into the past, and hoped that when she came back we would vaguely remember what went on before. They spent time trying to cobble together the 1967 Barnabas and the new one that could hang around Collinsport and not kill off the rest of the cast. They fixed him, but unhappily they ran out of storyline for him, and he ended up a homebody reading a lot of books.. There is a problem with Adam. He can be frightening, menacing, but there is nothing inherently scary about him per se. So, he is a test tube baby (actually a sewn up baby) but that does not conjure the fear than genuine supernatural creatures can create – because we know of their potential to do damage. Adam will or will not do damage depending on what he learns. He is one big baby who has a lot to learn. His scariness then depends of his “teachers”. Sure, he was born not according to God’s plan, and that makes him, in theory, an abomination. But do we get so worked up about this kind of abominations? Adam as a character depends on characterization to get people interested, and when that characterization slips, well, he is not that interesting. A few thoughts – while yes, this whole story with Adam (and Barnabus taking a bit more of a backseat) could have been better written maybe, probably. Some better planning could have given better story with what to do with Barnabus as a human. Traditional soaps from way back in the day found a balance between plot and character, i.e. something would happen (plot) and if several characters were in the room, the camera would go around the room with closeups, and just by the look on the actors’ faces (character), you could tell how they felt about what happened, just based on their character. The plot point might be re-capped (so the audience could get caught up) and give more characters a chance to react to the plot. This method of writing soaps fell by the wayside — old veteran characters shuttled to the background, in favor of letting the story unfold with little connection to the past, the past families, the past veteran characters. Had this spook show done a little more with slowing down, letting characters have a moment to react, even letting Barnabus have a more interesting and overt romance or potential romance/love triangle/love quadrangle with Julia/Vicky/Angelique, amidst all the supernatural/mad scientist stuff, the show maybe could have been more compelling. That said, for me, however, seeing all of this mostly for the first time and in sequence (not just once in a while on Sci Fi channel), I think it’s all REALLY COOL. OK, so maybe things are better with the werewolf and 1897, so I have stuff to look forward to. I love the show (am enjoying the Netflix disks), love your blog Danny, and love all the comments. If there is ever a slow day, Danny, and you want to do a blog entry with as many male DS actors in shirtless beefcake poses as you can find (there’s a compelling photo of Frid and Edmonds in swimsuits allegedly taken on Fire Island floating around the internet), that’s fine by me. Cheesy shirtless male beefcake pictures would certain liven up an otherwise boring ep blog entry! I like that backup plan; I’ll keep that in mind. Writing a multi week recap, as only Danny does, is hilarity ensued. I have to say, we need more Nicholas and less Adam at this point. And we get our wish when Angelique comes back. Something that bothers me about Adam–why does he have scars all over his face? I know in dramatic terms, we need to see him as some kind of Frankenstein monster, but wasn’t his head taken from a single body? I’m pretty sure that was stated or implied somewhere along the line when Lang was assembling him. So if it’s a head from one individual, why all the stitches on his face? Danny, many have said this before, but you are so, so very funny. 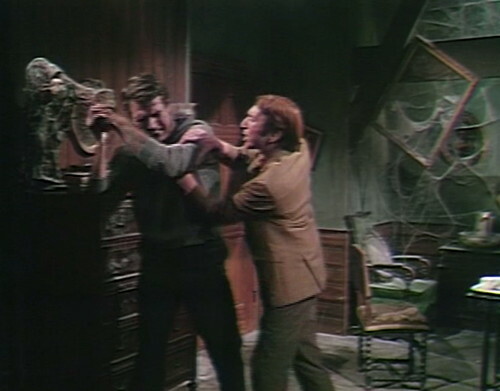 (“…strangling Barnabas on his way in lieu of filling out a comment card.” … “Everybody walks back and forth between Collinwood and the Old House a couple times, and eventually Barnabas finds Cassandra in his house again. She’s aged terribly during this storyline. We all have.”) thank you Prisoner of the Night for that all those fascinating freebies. especially the scoop on Victoria’s parentage. (a very interesting fellow is our Prisoner of the Night.) and Tim, you’re adorable.